Coming out of the long, cold winter months, I crave fresh greens above all else. But spring nights are cool, and warming comfort food still feels necessary during the shoulder season. No matter the weather, I like to make simple meals that can easily feed a crowd, yet don’t require a ton of prep time. This recipe is inspired by my recent visit to Fine Line Farm. As I listened as Sarah described their favorite spring dish: a risotto made with hoop house arugula and eggs from their chickens, my mouth was watering. Based on the “almost hands-free” risotto from Cook’s Illustrated, I came up with my own version with what I had on hand. It’s the perfect way to eat local, and eat well, without spending hours in the kitchen making dinner. This is an easy dish for farmers, and everyone else busy working outside, making the most of the season’s extended daylight. The “almost hands-free” trick to stirring less is using something like a heavy-bottomed Dutch oven that keeps heat evenly distributed and prevents burning. Heat the butter over medium high heat and when melted, add the minced garlic, stirring constantly until golden, then add the rice and stir for a minute or two, until rice is translucent. Add the white wine and reduce heat to medium. Cover the pot and let cook for 5-8 minutes, checking every so often, stirring if needed, and when the wine is absorbed, add the broth and water, and reduce heat to a low simmer, give it a few more stirs and cover. Cook for about 12-15 minutes, or until liquid is absorbed. You can stir occasionally if you want or you let it sit and the heavy-bottomed pan and liquid should keep it from sticking too much or burning. Note: This recipe allows you to be less attentive with stirring than the standard risotto recipe, which is helpful for busy cooks. However, I still like to stand over the stove and check it often so I can stir (I find stirring meditative), or add more liquid as needed. When liquid is absorbed, and the risotto is as creamy or al dente as you like, add the arugula, and stir frequently for another two minutes (until it’s wilted), then turn off the heat, add the lemon juice, a few pinches of sea salt (to taste) and ground pepper, and add the grated cheese over the top, stirring until well mixed. 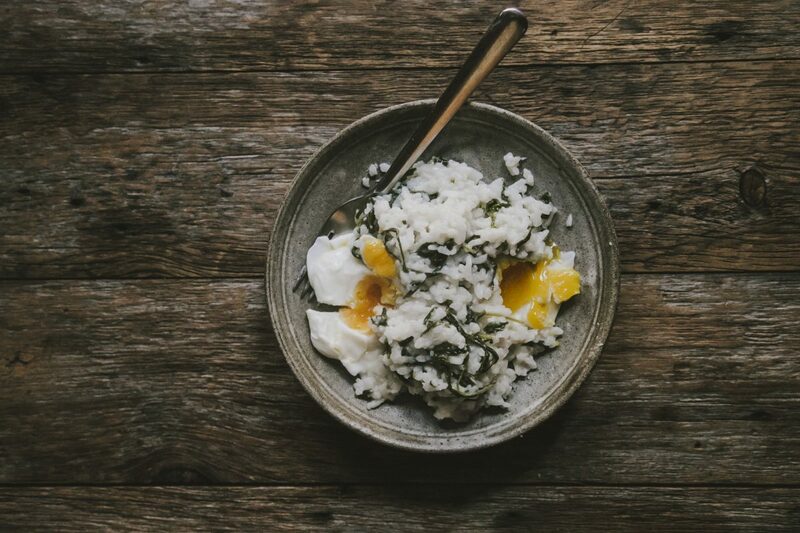 Poach the eggs and serve the risotto with 1-2 eggs per person.